When you’re on the go and your smartphone battery is low, in the not-so-distant future you could charge it simply by plugging it into your shoe. An innovative energy harvesting and storage technology developed by University of Wisconsin–Madison mechanical engineers could reduce our reliance on the batteries in our mobile devices, ensuring we have power for our devices no matter where we are. In a paper published Nov. 16, 2015, in the journal Scientific Reports, Tom Krupenkin, a professor of mechanical engineering at UW–Madison, and J. Ashley Taylor, a senior scientist in UW–Madison’s Mechanical Engineering Department, described an energy-harvesting technology that’s particularly well suited for capturing the energy of human motion to power mobile electronic devices. The technology could enable a footwear-embedded energy harvester that captures energy produced by humans during walking and stores it for later use. 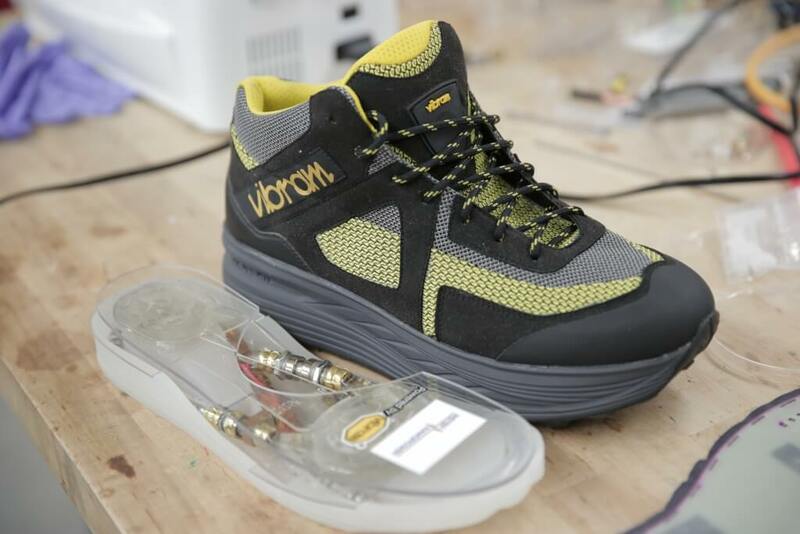 Power-generating shoes could be especially useful for the military, as soldiers currently carry heavy batteries to power their radios, GPS units and night-vision goggles in the field. The advance could provide a source of power to people in remote areas and developing countries that lack adequate electrical power grids. UW-Madison Mechanical Engineering Associate Professor Tom Krupenkin using the footwear energy harvester to directly power an LED flashlight. Krupenkin says tapping into just a small amount of that energy is enough to power a wide range of mobile devices, including smartphones, tablets, laptop computers and flashlights. For example, a typical smartphone requires less than two watts. However, traditional approaches to energy harvesting and conversion don’t work well for the relatively small displacements and large forces of footfalls, according to the researchers. “So we’ve been developing new methods of directly converting mechanical motion into electrical energy that are appropriate for this type of application,” Krupenkin says. J. Ashley Taylor (left) and Tom Krupenkin showing prototypes in their lab. The researchers’ new energy-harvesting technology takes advantage of “reverse electrowetting,” a phenomenon that Krupenkin and Taylor pioneered in 2011. With this approach, as a conductive liquid interacts with a nanofilm-coated surface, the mechanical energy is directly converted into electrical energy. The reverse electrowetting method can generate usable power, but it requires an energy source with a reasonably high frequency — such as a mechanical source that’s vibrating or rotating quickly. To overcome this, the researchers developed what they call the “bubbler” method, which they described in their Scientific Reports study. The bubbler method combines reverse electrowetting with bubble growth and collapse. The researchers’ bubbler device — which contains no moving mechanical parts — consists of two flat plates separated by a small gap filled with a conductive liquid. The bottom plate is covered with tiny holes through which pressurized gas forms bubbles. The bubbles grow until they’re large enough to touch the top plate, which causes the bubble to collapse. The speedy, repetitive growth and collapse of bubbles pushes the conductive fluid back and forth, generating electrical charge. “The high frequency that you need for efficient energy conversion isn’t coming from your mechanical energy source but instead, it’s an internal property of this bubbler approach,” Krupenkin says. The researchers say their bubbler method can potentially generate high power densities — lots of watts relative to surface area in the generator — which enables smaller and lighter energy-harvesting devices that can be coupled to a broad range of energy sources. The proof-of-concept bubbler device generated around 10 watts per square meter in preliminary experiments, and theoretical estimates show that up to 10 kilowatts per square meter might be possible, according to Krupenkin. 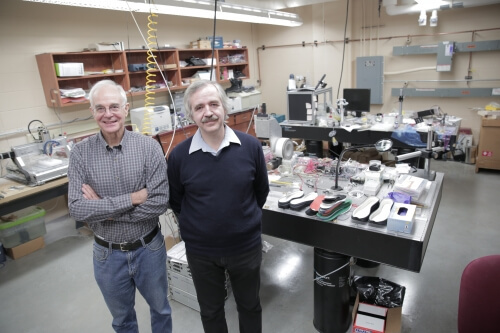 Krupenkin and Taylor are seeking to partner with industry and commercialize a footwear-embedded energy harvester through their startup company, InStep NanoPower. 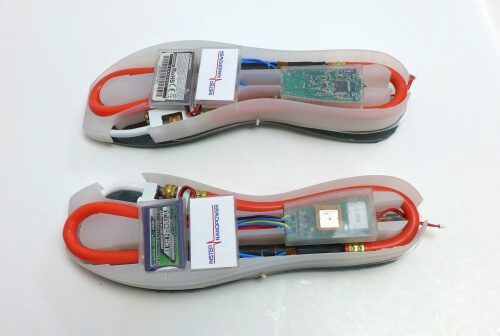 Their harvester could directly power various mobile devices through a charging cable, or it could be integrated with a broad range of electronic devices embedded in a shoe, such as a Wi-Fi hot spot that acts as a “middleman” between mobile devices and a wireless network. The latter requires no cables, dramatically cuts the power requirements of wireless mobile devices, and can make a cellphone battery last 10 times longer between charges. “For a smartphone, just the energy cost of radio-frequency transmission back and forth between the phone and the tower is a tremendous contributor to the total drain of the battery,” Krupenkin says. Additional authors on the Scientific Reports paper include UW–Madison mechanical engineering graduate students Tsung-Hsing Hsu and Supone Manakasettharn.